(Nanowerk News) Injectable nanoparticles that could protect an injured person from further damage due to oxidative stress have proven to be astoundingly effective in tests to study their mechanism. Scientists at Rice University, Baylor College of Medicine and the University of Texas Health Science Center at Houston (UTHealth) Medical School designed methods to validate their 2012 discovery that combined polyethylene glycol-hydrophilic carbon clusters -- known as PEG-HCCs -- could quickly stem the process of overoxidation that can cause damage in the minutes and hours after an injury. The tests revealed a single nanoparticle can quickly catalyze the neutralization of thousands of damaging reactive oxygen species molecules that are overexpressed by the body's cells in response to an injury and turn the molecules into oxygen. These reactive species can damage cells and cause mutations, but PEG-HCCs appear to have an enormous capacity to turn them into less-reactive substances. The researchers hope an injection of PEG-HCCs as soon as possible after an injury, such as traumatic brain injury or stroke, can mitigate further brain damage by restoring normal oxygen levels to the brain's sensitive circulatory system. The results were reported today in the Proceedings of the National Academy of Sciences ("Highly efficient conversion of superoxide to oxygen using hydrophilic carbon clusters"). "Effectively, they bring the level of reactive oxygen species back to normal almost instantly," said Rice chemist James Tour. "This could be a useful tool for emergency responders who need to quickly stabilize an accident or heart attack victim or to treat soldiers in the field of battle." Tour led the new study with neurologist Thomas Kent of Baylor College of Medicine and biochemist Ah-Lim Tsai of UTHealth. Their research targeted traumatic brain injuries, after which cells release an excessive amount of the reactive oxygen species known as a superoxide into the blood. These toxic free radicals are molecules with one unpaired electron that the immune system uses to kill invading microorganisms. In small concentrations, they contribute to a cell's normal energy regulation. Generally, they are kept in check by superoxide dismutase, an enzyme that neutralizes superoxides. But even mild traumas can release enough superoxides to overwhelm the brain's natural defenses. In turn, superoxides can form such other reactive oxygen species as peroxynitrite that cause further damage. "The current research shows PEG-HCCs work catalytically, extremely rapidly and with an enormous capacity to neutralize thousands upon thousands of the deleterious molecules, particularly superoxide and hydroxyl radicals that destroy normal tissue when left unregulated," Tour said. "This will be important not only in traumatic brain injury and stroke treatment, but for many acute injuries of any organ or tissue and in medical procedures such as organ transplantation," he said. "Anytime tissue is stressed and thereby oxygen-starved, superoxide can form to further attack the surrounding good tissue." 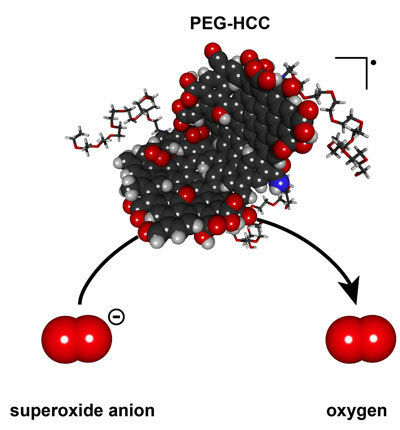 The researchers used an electron paramagnetic resonance spectroscopy technique that gets direct structure and rate information for superoxide radicals by counting unpaired electrons in the presence or absence of PEG-HCC antioxidants. Another test with an oxygen-sensing electrode, peroxidase and a red dye confirmed the particles' ability to catalyze superoxide conversion. "In sharp contrast to the well-known superoxide dismutase, PEG-HCC is not a protein and does not have metal to serve the catalytic role," Tsai said. "The efficient catalytic turnover could be due to its more 'planar,' highly conjugated carbon core." "PEG-HCCs have enormous capacity to convert superoxide to oxygen and the ability to quench reactive intermediates while not affecting nitric oxide molecules that are beneficial in normal amounts," Kent said. "So they hold a unique place in our potential armamentarium against a range of diseases that involve loss of oxygen and damaging levels of free radicals."